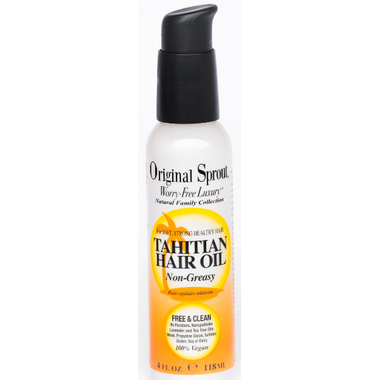 Why do women love this new Original Sprout Tahitian Hair Oil? Because we look, feel, & smell delicious head to toe! It adds a healthy, tropical glow to hair and skin, immediately soothing dry hands, elbows, feet & hair into silky softness! Treat yourself to our multi-use, divinely healthy vegan moisturizer. Ingredients: Non-Greasy Vegan Oils of Cyclopentasiloxane, Dimethicone, Dimethiconol, Ananas Sativus (Pineapple) Fruit Extract, Cocos Nucifera(Coconut) Oil, Cyclohexasiloxane, Dipteryx Odorata Seed Extract, (Gardenia Tahitensis) Flower Extract, Linum Us Non-Greasy Vegan Oils of Cyclopentasiloxane, Dimethicone, Dimethiconol, Ananas Sativus (Pineapple) Fruit Extract, Cocos Nucifera(Coconut) Oil, Cyclohexasiloxane, Dipteryx Odorata Seed Extract, (Gardenia Tahitensis) Flower Extract, Linum Usitatissimum (Linseed) Seed Extract, Prunus Armeniaca (Apricot) Fruit Extract, Pyrus Malus (Apple) Fruit Extract, (Vanilla) Planifolia Fruit Extract. Doesn't leave grease on hands. My daughter has thick curly hair and this oil makes her hair so soft and much easier to comb out after a bath. It also smells amazing and I love that it has safe ingredients. I have been using this product line on my daughter since she was a toddler and all of their products are amazing! Love it! Awesome smell, multi purpose, great for travelling as it is moisturizing for skin (including face) and shine for hair. So glad that Well.ca is carrying this product line.